When it comes to the direction of Johnnie To I have a love / hate relationship. I like his style and action but the story telling and characterization is always something I have to force myself to get through. It only becomes tolerable and manageable because of the excellent actors like Anthony Wong and Simon Yam. They bring that something extra even when the characters they play are incredibly flat. In Exiled and The Mission this nihilism worked in favour of the simple plots. Here in Vengeance it completely fails. 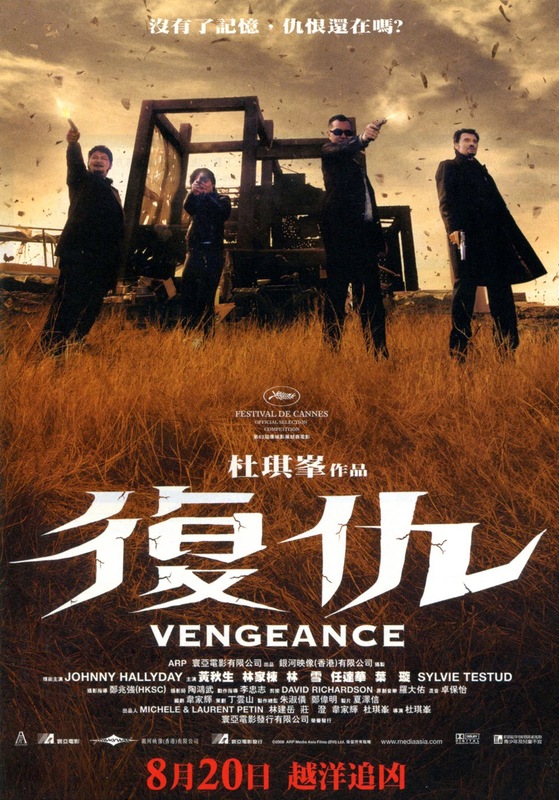 Johnny Hallyday as Costello who is out for revenge suffers from a short term memory. Something really interesting could have been done with this. Instead we get scenes that I suppose were meant to be dramatic become farcical. It makes all the serious and intense acting look ridiculous. There is a plot point where Anthony Wong and co are wondering how to proceed. The motivation given is so underwhelming and preposterous that I had given up on taking the film seriously at all. But even watching this in less serious manner the film does it's best to make it even more unbelievable. I gave Vengeance a chance but this is all style with no substance in a very bad way. Huge time waster!